Landon and Jason playing a show at Kilby Court on their last US Tour. 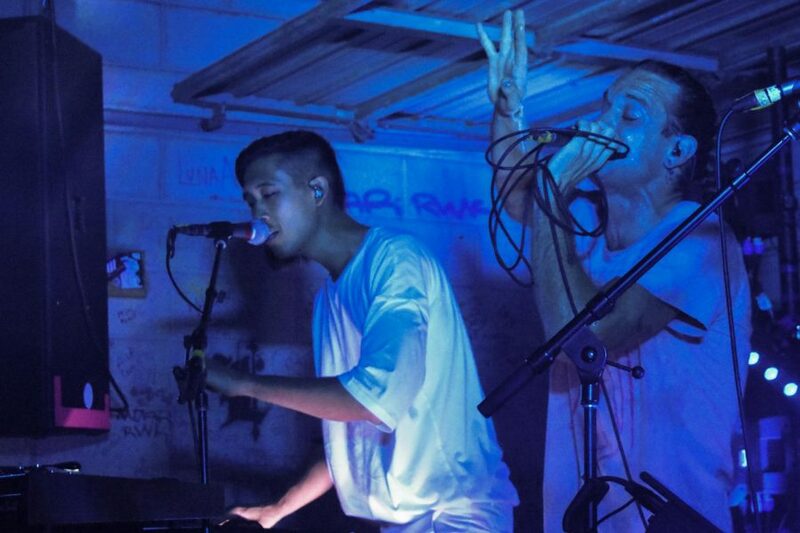 Sir Sly is an alternative rock band hailing from Southern California, that has consistently grown in popularity since they started the band in 2012. The band’s most popular song is “High,” which was the first single off their most recent album, Don’t You Worry, Honey. This song is an example of the collaborative process that the band goes through. They went through many stages of edits and changes to make the song something that they were proud of, and they genuinely felt it could be a successful song. It peaked at number three on the US Alternative Rock Chart, and number 18 on the US Rock Chart; the song also held the number two spot of Alt Nation’s Alt 18 Countdown for three weeks, and was somewhere on the countdown for 19 weeks. Each of their songs have a unique sound to it, that isn’t common with other bands. The band’s sound most directly comes from Jason’s distinctive approach to each instrument and the sampling of it. He takes normal sounds and alters them to fit the sound he wants; layering the sounds on top of one another to create something brand new. This is even more apparent in the song “&Run,” which Landon said was “Jason’s masterpiece more than any of the other song.” The song began on an acoustic guitar, but listening to the final product, it’s almost impossible to tell. They took inspiration from many music styles and artists, and brought them together to create something that is all their own. The most startling thing as a fan is to see the emotion that Landon puts into singing each of these songs every night while on tour. This is most apparent when they play “Oh Mama,” which is a song he wrote about his mother, her death, and how he coped with it. Seeing someone go through so much to play a song that is so meaningful to them for a venue full of people is a very powerful thing. The song includes a voicemail from Landon’s mother, and this really hits home the reality of it. It’s hard to imagine reliving something as painful as the death of your mother in front of a crowd of people, but it’s a beautiful song with layers of poignancy and feeling. While their songs often seem very serious, these guys are often very laid back and funny people. Landon echoed this idea, saying, “We had a lot of fun making this album,” referencing Don’t You Worry, Honey, “It wasn’t just strenuous creative work, it was also, ya know, three guys who enjoy making music together, and a lot of times have a lot of fun doing it along the way.” Even while they’re on stage, they’ll still be messing around with each other and talking to the audience. Guthrie concerts have a very comfortable, familial atmosphere that you don’t often find at rock concerts. Sir Sly following has grown exponentially in the past year, and doesn’t seem like it will be slowing down anytime soon. Even with all their recent success, they are still extremely down to Earth and genuine guys who appreciate their fans. Each member of the band makes an effort to meet fans after shows, talk to fans on social media, and just be generally kind and respectful people. Check out Sir Sly’s show at In The Venue (579 W 200 S, Salt Lake City, UT 84101) on January 26th, opening for K. Flay! Tickets are only $20.